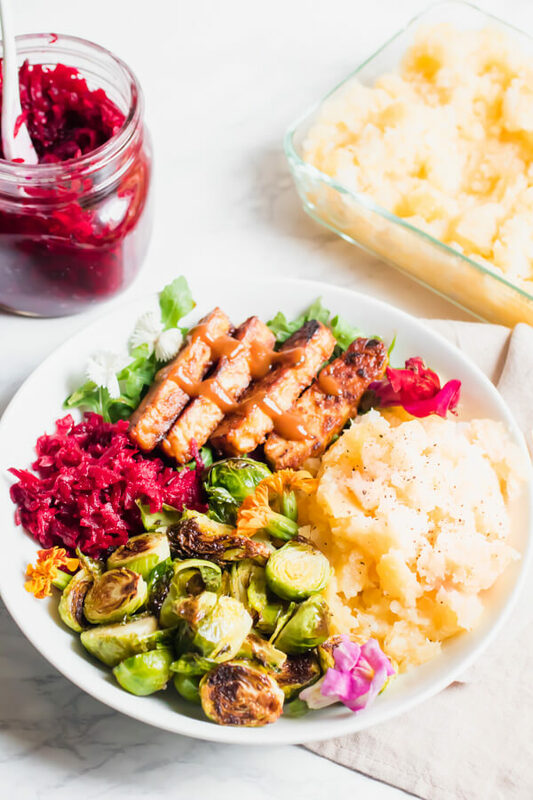 Buttery mashed rutabaga and turnips topped with easy BBQ tempeh, roasted Brussels sprouts, and a sweet and spicy beet relish. 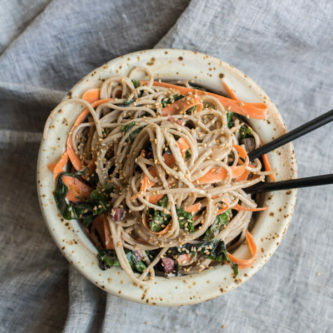 This vegan meal prep lunch will have your taste buds doing the happy dance! I know there are a lot of funky words in this recipe (Rutabaga?? Tempeh?? Turnip?? Come again?) but you guys I am telling you it is worth it to step outside of your comfort zone and give some of these plant foods a try! We are smack dab in the middle of winter, and here in the northeast, that means there is not an abundance of local fresh produce available. It is, however, officially root vegetable season, and I am now your self-appointed root vegetable guru. 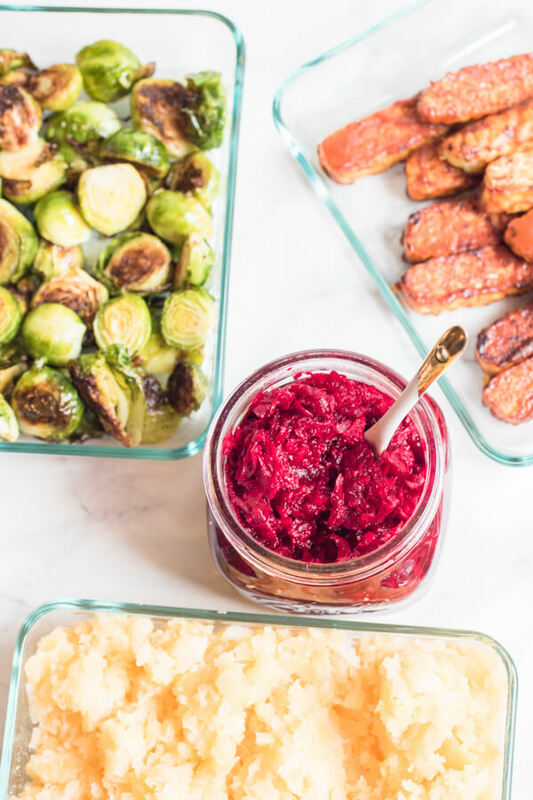 Turnips, beets, and rutabaga may not be on your weekly grocery list, but after you try this recipe you may just be trading in your broccoli for a little turnip love! Quick nutritional aside: variety in your diet is fundamental to optimal health. We all tend to get into food ruts, purchasing the same 5-10 fruits and veggies each week. 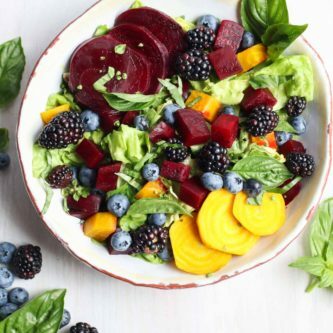 Remember that each vegetable has a unique synergistic combination of phytonutrients, antioxidants, and minerals. If you are always eating the same 5-10 fruits and vegetables you are always getting the same nutrients. Let’s mix it up a bit! Starting with rutabaga and turnip. Rutabagas are a root vegetable and a hybrid between a turnip and wild cabbage. In most parts of the world a rutabaga is called a “swede”. Rutabagas are in the brassica family of vegetables, commonly known as cruciferous vegetables. Cruciferous vegetables include broccoli, cauliflower, cabbage, kale, and Brussels sprouts (to name a few). What are the Health Benefits of Rutabaga? Cruciferous vegetables, rutabaga included, contain high amounts of antioxidants and anti-cancer compounds. Rutabaga is an excellent source of vitamin C, one cup of rutabaga contains 53% of the daily recommended value of vit. C.
Rutabagas also contain postassium, manganse, fiber, calcium, magnesium, vit. B6, and phosphorus. I grew up eating rutabaga, it is my dads’ favorite veggie (odd, I know). I find rutabaga to be nutty and sweet. A cross between a parsnip, a potato, and a turnip. My favorite way to cook rutabaga is mashed, like in this recipe. I simply peel it, dice it and boil or steam it. Then mash with butter (or vegan butter), or coconut oil, salt, and pepper. You can also roast rutabaga (amazing with Chinese five-spice powder) or add some diced to soups or stews. I’ve added it to beef stew and my 17 vegetable soup (recipe coming soon!). Turnips have a similar nutritional profile to rutabaga as they are both in the brassica family. In this recipe, I mashed rutabaga and turnip together. 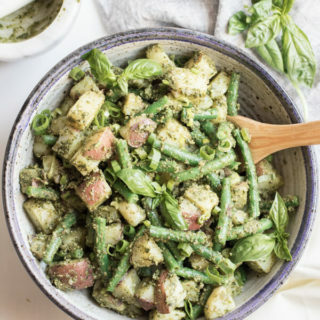 You can certainly add 1 or 2 white potatoes to the mash to help introduce these new veggies to yourself and your family. Tempeh is a fermented soybean product, typically made from whole soybeans that have been cooked, fermented and formed into a firm patty or a block. Tempeh can be made with any type of bean or grain but is most traditionally found as a soybean product. Tempeh is firm and tastes nutty and earthy. I find it to be similar in taste to mushrooms (umami heaven) and is delightful when seared to crispy browned perfection. 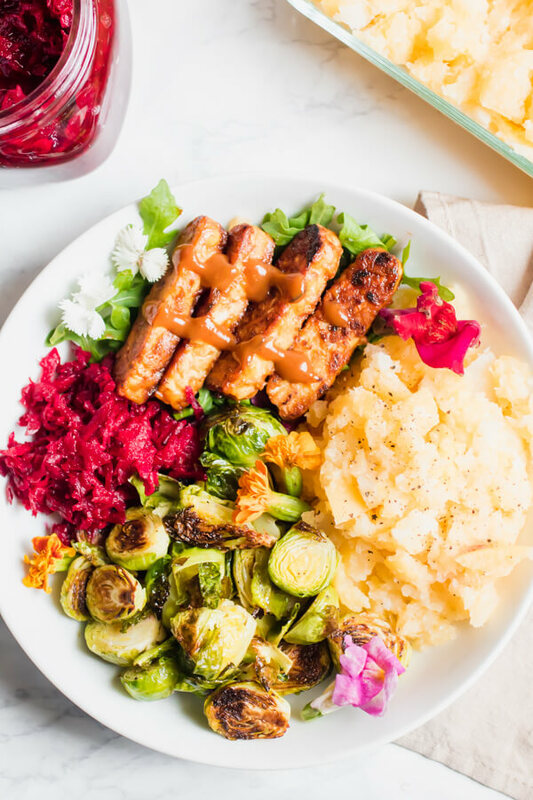 Tempeh is an excellent source of plant-based protein. 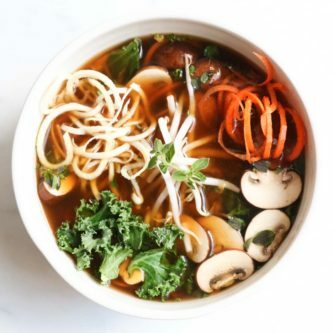 Isn’t Soy Bad For Me? I do not believe that soy has “estrogenic” effects (as often touted on the interweb) but rather contains cell regulating effects from brain health, to heart health, to prostate health and breast health. Okay, enough science for today. I love these bowls as meal prep lunches all week long. 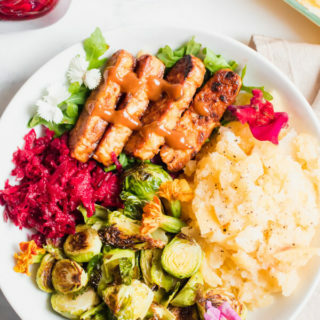 Crisp up your tempeh – super easy peasy, just saute in a skillet with a little oil, and then add a bit of your favorite BBQ sauce at the end. 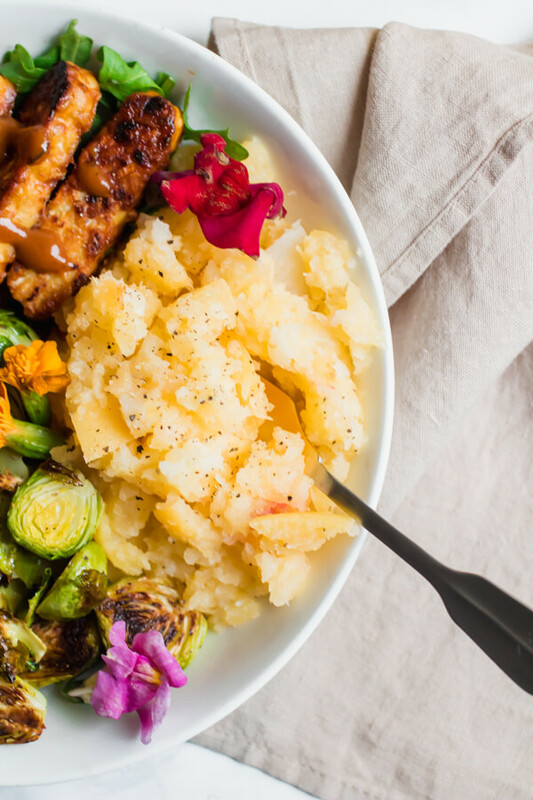 Roast some Brussels – because every nourishment bowl needs some Brussels! There you have it. I store everything separately and then load up my bowls when I am ready to dig in, which has been every single afternoon this week! 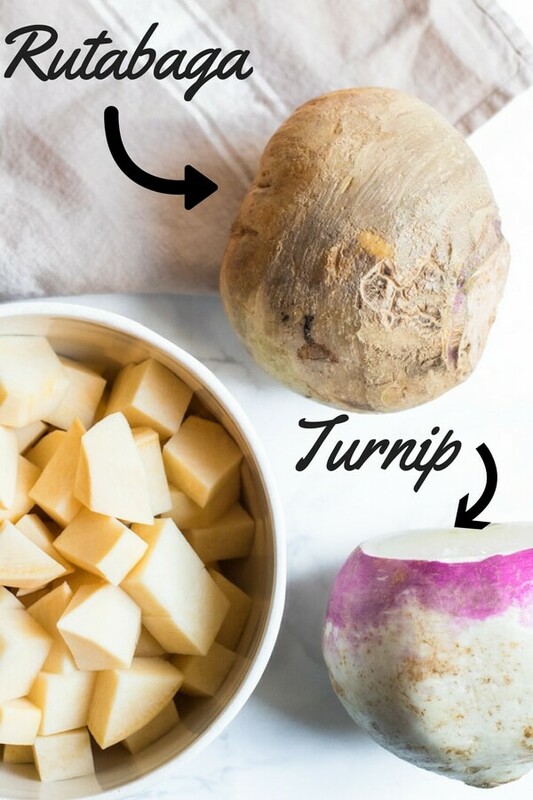 Place rutabaga and turnip in a medium sized pot. Cover with water. Boil for 25 minutes or until tender. Drain. Add butter, salt and pepper to pot and mash using a masher or a handheld mixer. (alternatively place root veggies, butter, salt and pepper in a food processor and process until smooth) I like a chunkier texture. Slice tempeh into 1 inch pieces. Heat a medium saucepan on the stovetop. Add avocado oil and saute the tempeh until crispy and brown, about 3 minutes per side. When browned add BBQ sauce and saute until well coated (about 2 minutes). Trim ends off Brussels sprouts and cut in half. Spread out evenly on a large cookie sheet. Toss with olive oil, salt and pepper. Roast in 425° oven for 20 minutes, tossing once or twice during cooking. Combine grated beet, apple, and ginger in small bowl. Toss with apple cider vinegar, honey, lime juice and salt. Store in an airtight container in fridge for up to 10 days (I use a mason jar). 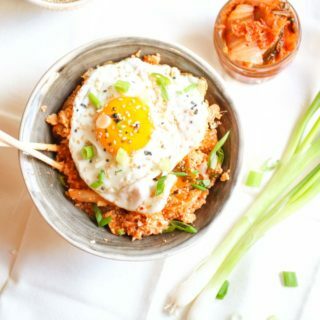 Add a generous portion of each ingredient in a bowl. Smile. Beet relish is AMAZING on sandwiches! 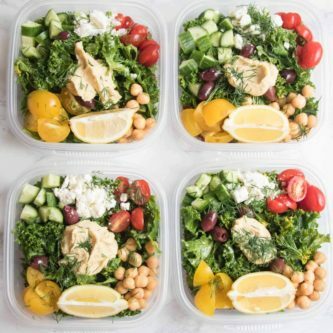 Meal Prep Inspiration Coming Your Way! 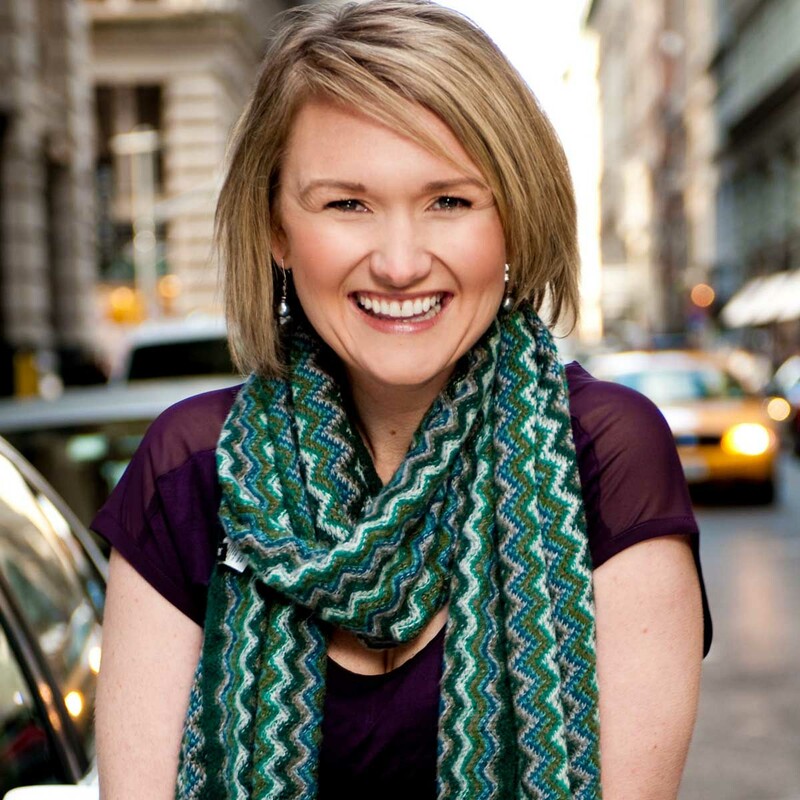 I have been making personalized meal plans for my private clients for over 13 years. 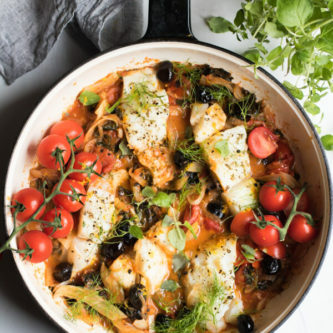 I know that having a bit of structure around meals can be a supportive way to shift into a healthier way of eating. After a bit of a push (thank you to my clients and readers that have asked for this!) 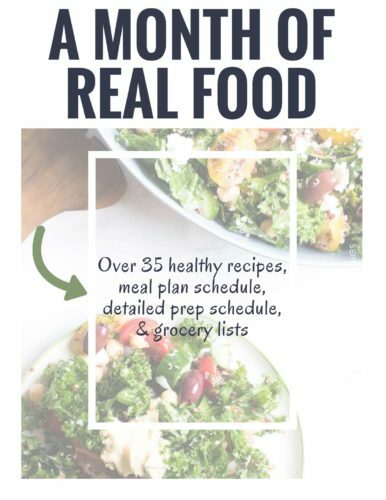 I put together a 30-day Real Food Meal Plan for you! 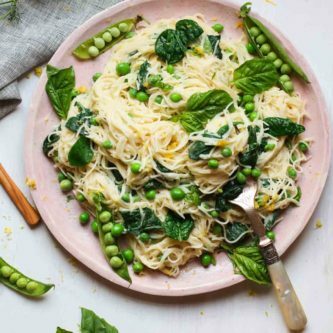 A nutritionally balanced, delicious 30 day meal plan. Whenever I see the words “vegan” and “lunch” I can’t click through fast enough to get to the recipe! But I have a few questions (although it looks like an amazing dinner as well!). Do you eat it cold? I need to tote my lunch to the office where I can refrigerate, but there are no small appliances. Also, what do I see drizzled on top? The beet relish is definitely going to be made very soon!! Thanks!!! Ha, that’s awesome! 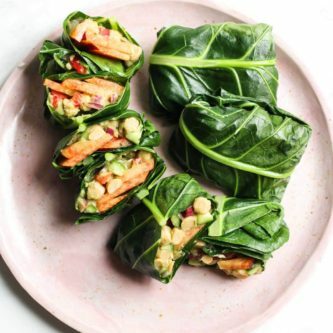 Plant-based lunches are totally my jam! Ok, so I don’t eat it cold, I either it warm or room temperature. I don’t like food hot or cold (I’m just like little red, needs to be just right). So I typically heat it and then let it sit for a bit before I eat it. The rutabaga/turnip mash is a little potent cold, it does need a bit of heat. I drizzled just a bit more bbq sauce on top of the tempeh. 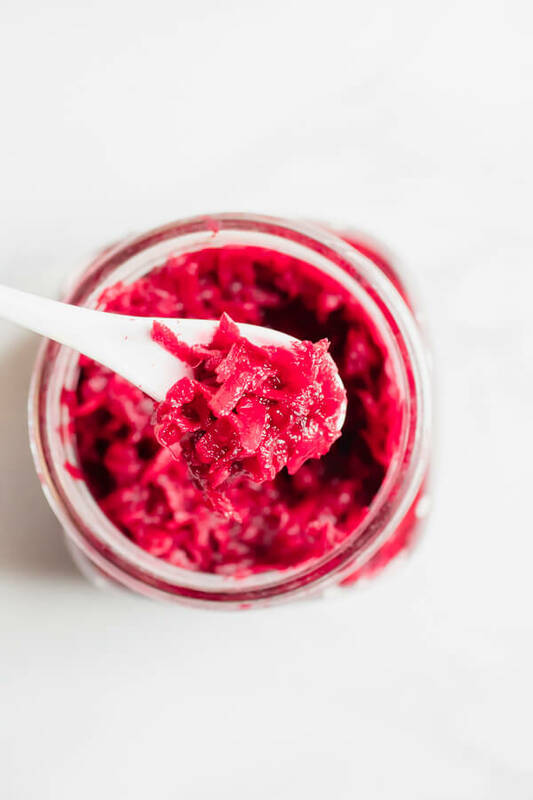 My beet relish is almost gone, it’s so yummy!! Thanks for reading Suzy! 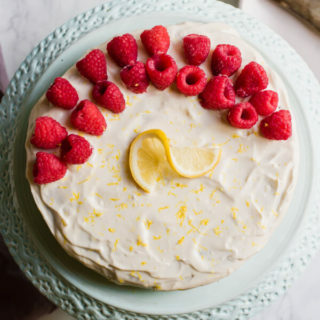 Pass me the bowl please .. so yummy.